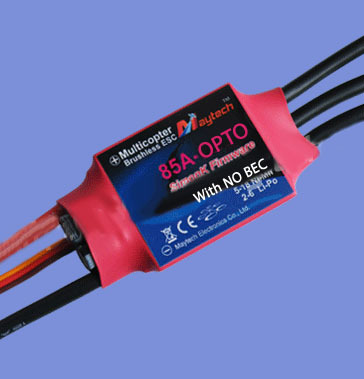 MT85A-OPTO-HS-MK V1 (with SIMONK FIRMWARE) ESC is specially designed for multi-rotor copters. The ESCs are loaded with dedicated optimized software, for extremely high performance on MultiCopters. It will increase the handling and stability of multirotor greatly. Note: This model V1 is what you want for multicopter use. "Multicopter ESCs with NEW Simon K firmware, with active-wheeling function. We cooperated with Simon kirby and developed Simonk firmware specially based on our ESCs. 2. More stable flight. Due to the "active breaking" effect, the deceleration especially with big motors and props is much faster than without freewheeling. This massively increases flight stability at multicopters. 3. ESC is not heating up that much and it is more efficient during part load." - Handle fast refresh rates. ESCs operate with over 450Hz refresh rate. - ESC firmware is optimized for quadcopters / multicopters. - Excellent Reliability. Our distributors worldwide give us feedback that our ESCs have the best reliability rate with their customers of any brand of ESCs they have ever sold. Maytech Eagle-Multi series ESCs come with SimonK firmware and specially used for multi-rotor copters. As all parameters have been pre-set for multi-copter flights in SimonK firmware, the ESCs cannot be programmed. Throttle Calibration still can be done. Disclaimer: Before you buy these esc, you should make yourself familiar with the somewhat experimental nature of the SimonK firmware. This software pushes the motor response to the limit. Due to the lack of overcurrent/overheat/low voltage sensing, it's easier to destroy the ESC and possibly the motor. Please consult the SimonK threads on various forums for more info. The esc reseller, esc manufacturer, nor SimonK will be responsible for any damage that may occur from use of this product. Please know and accept the risks before using these. SimonK firmware is the firmware of choice for hobbyists as well as professional multi-rotor pilots.